I was going to say this is the best book I have read so far this year but I looked back and saw that I have read many great books in 2018. I will say it is near the top of the best five. It was so great that I could not read anything else for a couple days. The main characters are trees. They are not given dialogue but Richard Powers and one of his other main characters speak for them. Four main characters come to awareness about trees and their role in the eco-system of planet earth: a female scientist who discovers the trees communicating with each other, a soldier from Vietnam saved by a banyan tree, an artist whose life has been shaped by the dying of the American chestnut, and a college coed brought back to life by what she perceives as creatures of air and light. These four humans plus five others are, in various ways, summoned by the trees which are dying at a fantastic rate in this era of clear cutting and climate change. Most of them meet up during the eco-terrorist protests in the late 20th century American northwestern redwood forests. Remember the tree sitters in Humboldt County, CA, in 1997? Did you ever read The Monkey Wrench Gang by Edward Abbey? Yes, protesters like that. The five other individuals also connect with or are influenced by the main four through the ways strangely serendipitous communications sometimes occur between people. These connections are similar to the ways trees communicate, at least they are made similar by the author. Richard Powers is as lush as an Amazonian rain forest in his writing. He tells the back stories of all nine people, he draws a quantum mechanics/multiverse type literary diagram in stories. He describes the natural world like the scientist he is. If this sounds complex, it is, but not hard to follow or understand. In fact, this is a page turner extraordinaire. As wonderful and amazing as these characters are, the trees (their roots, understory, trunks, branches, and overstory) are the heroes of this tale. As when I read Braiding Sweetgrass by Robin Wall Kimmerer, I came to see the natural world in a new light, to be made certain that I am part of it in a complete symbiotic relationship. The major difference between the natural world and humans is that it always knows what it is doing and we hardly ever really do. Did I feel hopeful after finishing The Overstory? Yes and no. I felt hopeful for the natural world but not for the human race. After we as a species have met our demise, the natural world will recover. If you read this novel and it doesn't change you, you are either already more enlightened than most or you are part of the problem. Lovely review, Judy, fitting too! I will be reading this novel towards the end of this year, BTW, it was longlisted, along with Warlight and The Mars Room, among others, for the Man Booker Prize. Hence my interest. I am so excited to know you will be reading this novel. I did know about the Man Booker longlist. I wonder if he will make it to a finalist. Are you going to read The Mars Room also? I hope he make it to the shortlist at least. So do I. I had never read him before but I like the way he writes. I decided to read his books in backwards order of publication instead of the way I usually do. I just ordered the book before this one, Orfeo. "Richard Powers is as lush as an Amazonian rain forest in his writing." Perfect description, and your last sentence is right on point. Excellent review of this marvelous book. Wow, great review!! 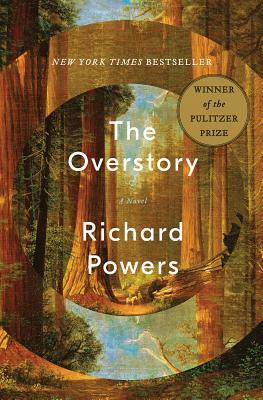 The Overstory sounds like a powerful read and one I want to read. I hope you get to read it soon. What an outstanding review...so much passion, Judy. I do want to try it but it sounds like I need to find a month where I can just focus on this book to really appreciate it. I read it was a chunkster at over 600pp. Thank you Diane! Actually it is only 502 pages-ha ha. I read it quite quickly because the writing is so accessible. Ha! Love the last sentence. Not sure I'm hopeful for the human race either. I like animals better. As different as this book's premise sounds, I think you totally sold me on it. A novel about trees? Why yes. Oh you would love it I am sure! I love it when you catch up on my posts all at once. It gives riches in comments. Thanks for being a blogger friend. What a great review. This sounds like an interesting book with a really unique premise! Thanks Angela. Perhaps the trees might save our planet. Oh yes, do look more closely! Thanks for reading my review and for your comment.